Cosmology and astrophysics may help guide physicists in building a model of “unparticles,” a newly proposed sector of physics. Recently, Hooman Davoudiasl of Brookhaven National Laboratory has investigated some basic requirements that unparticles must fulfill to ensure that our standard picture of the universe remains intact. Davoudiasl is one of a quickly growing number of physicists that have become intrigued by Harvard University professor Howard Georgi’s suggestion earlier this year that there might exist a new type of substance that cannot be described in terms of particles because its components are scale-invariant. This characteristic means that these unparticles don’t change appearance when viewed at different scales—which is very different from objects we’re familiar with. However, unparticles might be observed interacting with the standard model particles through suppressed operators. “Georgi's proposal has motivated many physicists to inquire whether we could have missed something so exotic, in our current or future experiments, if we did not consider its signatures,” Davoudiasl told PhysOrg.com. Now, Davoudiasl has tried to place constraints on what unparticles might be so that physicists might have an idea of where to look for them in new experiments, notably in the Large Hadron Collider. “My work points to stringent cosmological and astrophysical constraints that could shape how we view the viable parameter space of unparticle models,” he explained. One of the strongest constraints, Davoudiasl says, might be imposed by Big Bang nucleosynthesis (BBN), the model that describes the creation of light elements after the universe cooled during its first few minutes. By the time the first particles coupled with each other to form light atomic nuclei, the unparticles must have already separated themselves out from the particles if they were to not interfere with BBN (a model that works very well). Davoudiasl explains that this decoupling of unparticles and particles would likely have occurred during some earlier and hotter seconds of the universe when temperatures reached at least 1 GeV. After the transition to BBN, latent heat would only heat up the particles, leaving the unparticles much cooler. As in previously studied extra-dimensional models, although unparticles might cool the hot particle plasma to a degree, most of the cooling must still be caused by expansion. Although unparticles would have to be decoupled during BBN, they might be able to recouple later, where they might interact with neutrinos. 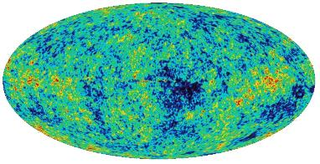 If so, then Davoudiasl predicts that the resulting fluid might lead to nonstandard shifts in the location of the acoustic peaks of the cosmic microwave background. Another possibility is that unparticles may couple to dark matter such as WIMPS (Weakly Interacting Massive Particles). Possibly, unstable dark matter produced in the early universe could have decayed into unparticles, WIMPS, and/or other types of dark matter. Davoudiasl explains that about 5-10% of the original WIMP population could have decayed into unparticles, and still fit within today’s measured cosmological parameters. If so, then unparticles would have about the same energy density as baryonic matter. If unparticles are to make up any part of the cosmic energy density, they could be able to decay back into standard model particles, Davoudiasl explains. He assumes that such a cold scale-invariant gas could return back into the visible sector by leaking energy into massless photons. If this leakage occurs on very short time scales compared with Hubble time, it could again distort the cosmic microwave background. Together with BBN cosmology, astrophysical processes such as supernovae could constrain unparticle models, as they have helped constrain other types of light physics (such as axions). Davoudiasl hopes that these constraints may serve as guides for building unparticle models and ultimately observing them--if possible--in experiments. Citation: Davoudiasl, Hooman. “Constraining Unparticle Physics with Cosmology and Astrophysics.” Physical Review Letters 99, 141301 (2007). Yay, another "Theory of Nothing". Amen, brother. Unparticales. More like unscientists. Give me a break. Yet again we're back to Aether. Lets get real here. Hoverboard real. Ragtime, I've been away for a while... have you admitted that you are zephir yet? and to quantum_conundrum and earls, I always like to wonder if the people on this site who like to say things like "more like unscientists" - are those people actually scientists themselves? Personally I'm willing to bet otherwise. "Lets get real here"... yeah, lets stop trashing the work of professional physicists from the safety of an anonymous internet comment. By the way, don't talk about "what science is" and all that... unparticles are a hypothesis, and these guys are attempting to find ways to verify or falsify that hypothesis. You will note that none of them hold faithlike belief in unparticles without any evidence, like as though it was religious dogma - they are treating it as a hypothesis. You'll also note that if they did find unparticles, it would be a major advance in our knowledge of the universe. With these things in mind, what is so unscientific about testing the unparticle hypothesis?